The team gathered round for a meal. 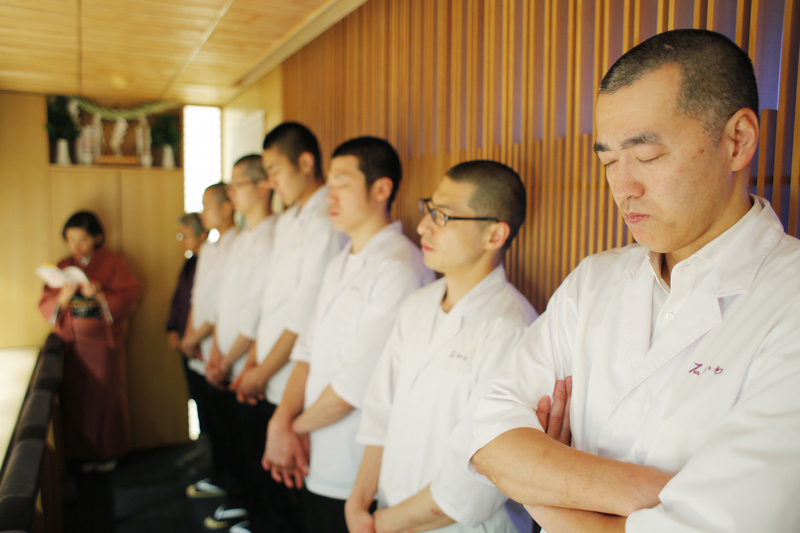 In 2015, sister shop Kohaku also got three Michelin stars, with Ren garnering two. Kohaku and Ren are respectively run by Messrs. Koizumi and Mishina, who both trained at your shop. It’s quite an honor. As my staff grew and developed their chops, they set out on their own to create these two shops. Ishikawa started with three people, me included. Today, the team has grown threefold. Furthermore, many of our members stay on for many long years. You frequently organize birthday events among the three shops, employee trips overseas, and other opportunities for interaction. I threw a birthday bash for someone, they felt like they wanted to give back in gratitude, so at some point, the events became a sort of talent show where everyone performs some skills for the others and presents them with food. Now it’s turned into a high-stakes competition. (laughs) We couldn’t have this interfering with the regular work, so we moved this monthly event to a bi-monthly affair. While those events are fun, one signature of our shop is our nightly get-togethers. Not only do we catch up and report on the day’s work, but we even have a reading circle and a few other aspects. The nightly meeting: a must at Ishikawa. Today’s event was a reading circle. A reading circle is quite unusual for a restaurant. Reading is essential. Reading good books goes beyond cuisine. It’s essential to the education of the individual and forming one’s persona and attitude. These days, we’ve turned it into a reading circle, but in the past, we also had events where we would select a theme and discuss our aspirations, hobbies, et cetera. The meeting has changed over time, but the emphasis remains the same: for 10-odd years, the goal has been to share about ourselves with others. When the day’s work is busy, it’s easy to slip into a pattern where the kitchen and floor staff fail to communicate well and end up wrapped up in their own work. I wanted to avoid that at all costs, so I searched high and low for a solution. We started the nightly meetings in the second year of business. I wanted team members to not look at the other staff as “robots” just engaged in performing a task, but as thinking and feeling individuals on the same team. You got started on that quite early on in the shop’s history. Were you aware of certain issues in training the team? There was a period where we had high turnover among young employees. Naturally, some people are more or less disposed to work in the culinary world, and everyone has their own circumstances. I didn’t want people who quit feeling bad about their choice. However, I am always forlorn to lose a team member. I would bawl. I still do.Think about it — in some sense, I’m the one that spoiled their dreams, that caused them to quit. No one joins the culinary world with a desire to have a bad experience. Everyone comes with hopes and dreams — to think that I trampled them is unbearable. But crying would solve nothing. I wanted to do something that would make employees happy to continue working here. We understand that, in addition to reading circles and birthday get-togethers, you take the team overseas to train, have a company dormitory, and publish a newsletter. This seems quite different from the world of apprenticeship in which you grew up. While there were unfair aspects to the apprentice system, it had its benefits. The master would look after us both on the job and in our personal lives, and interactions with the master and other senior pupils taught you how to relate to others. Nowadays I feel that even the stricter, unfair elements help you grow as a person. For my part, I want to retain the good of that system while creating a newer, better one. That goes for both cuisine and the design of shops. I want to do something new that hasn’t been tried before. I believe that’s the true meaning of this kind of work. I don’t mean to boast, but the reason patrons favor our shop is because the cuisine, the plating, and everything else is somehow different from the usual, without being so much so as to seem strange. It’s the kind of thing that feels new and yet familiar. That’s the kind of ambiance I want to create. To keep that system going requires building a climate where employees and suppliers are happy to work. 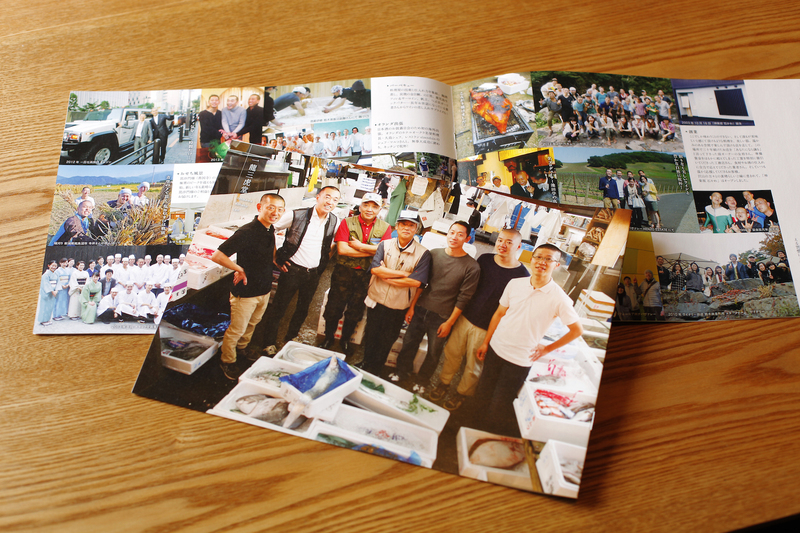 A periodically-published company newsletter showcases employees and suppliers with whom the restaurant works. The magazine is distributed to employees and their families. Competition in the restaurant industry is fierce, so it’s easy to be drawn to the question of profit margins. “Crap” is an essential process to life, but it’s a process, not a destination. If you make that your goal, you’re definitely going about it wrong. If your business produces good items, does work that makes people happy, and becomes a healthy concern, profits will naturally be “produced” as part of its lifecycle. Since founding the company, we’ve never set a single numerical target. That would be putting the cart before the horse. After opening, we struggled for several months. Even though customers didn’t come, I was adamant about continuing to buy the best ingredients. Even if we had just one customer per day, I wanted that customer to be happy. Koizumi and I put our heads together and thought of the best approaches. The shop has succeeded thanks to the support of many people. However, I believe this is especially owed to the fact that, over these twelve years, I’ve put people’s happiness first — before profits. When training the team, I instruct them in the importance of shoring up their personal character and acting as consummate professionals in order to make the customer happy. That’s the first thing. This is true as a chef and in any other role — you have to deliver your best for the customer. This is something I’ve finally really come to understand after doing hands-on learning at various workshops. You wouldn’t believe it, but today, aged over fifty, I spend lots of time on workshops.When I went independent, I wanted to do something that would help the world, that would contribute to the world at large. However, reality was not quite so easy. My own desires took precedence.Through workshops, I’ve chipped away at that and learned what it really means to give back. Strangely enough, I’ve now started to be called to do various educational work, such as taking part in conferences at culinary schools and supervising the opening of shops in Japan’s rural regions in order to stimulate their local economy. I’m also taking part in a project with professional videographers to share footage of Japanese scenery to the world at large. I still put working in the kitchen first and foremost, so I can’t give my undivided attention to these projects, but, with the help of my team, I want to do my utmost to contribute to various projects that can help society. What are your thoughts on promoting Japanese cuisine in an international context? I don’t think there is any need to rush things. Authentic quality is something that takes hold naturally over the years. In order to get there, I believe my role is thoroughly training a generation of young chefs. We have at least a few parties of guests from overseas every day, so I believe that if we can deliver a satisfying experience to them, they will go home and preach the quality of Japanese cuisine.Taking the long view, if the younger generation training at my shop goes on to work overseas, they can help promote Japanese food far and wide. If you try to control everything, things will not go to plan. That’s something I’ve really come to learn today. Quality cuisine can simply be presented as-is — you don’t need to bend over backwards and shout it from the rooftops. The food speaks for itself. I intend to just steadfastly do my part in this way. I want to bring joy to people through food. 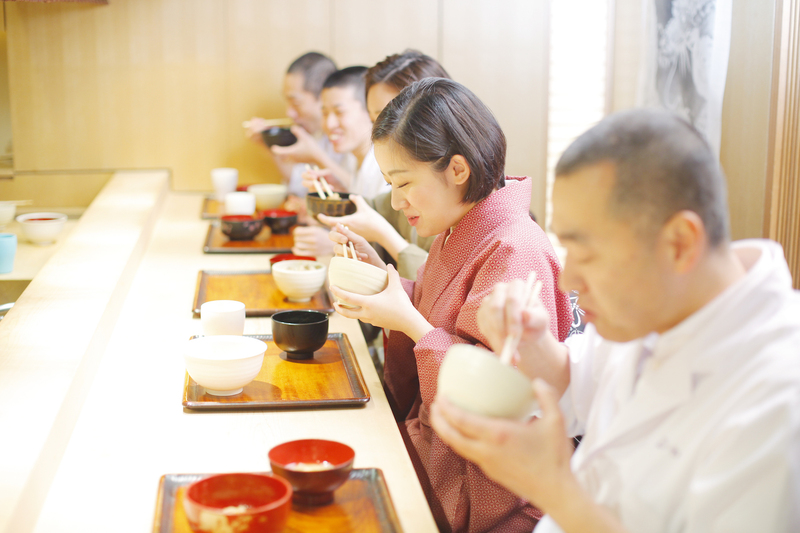 If that effort grows to go beyond Japan and beyond the generations and creates a world where Japanese cuisine is the emblem of beauty and quality, that will be great. But I want to go slowly and steadily, always putting my emphasis on people first. For this installment, we also spoke with two members of shops under the Ichiryu Sankodo operation: Messrs. Koizumi of Kohaku and Mishina of Ren. They enthusiastically agreed that "Ishikawa is, above all else, extremely kind to his team." This resonates with Ishikawa's own remarks about breaking down into tears when a member of the shop resigns. 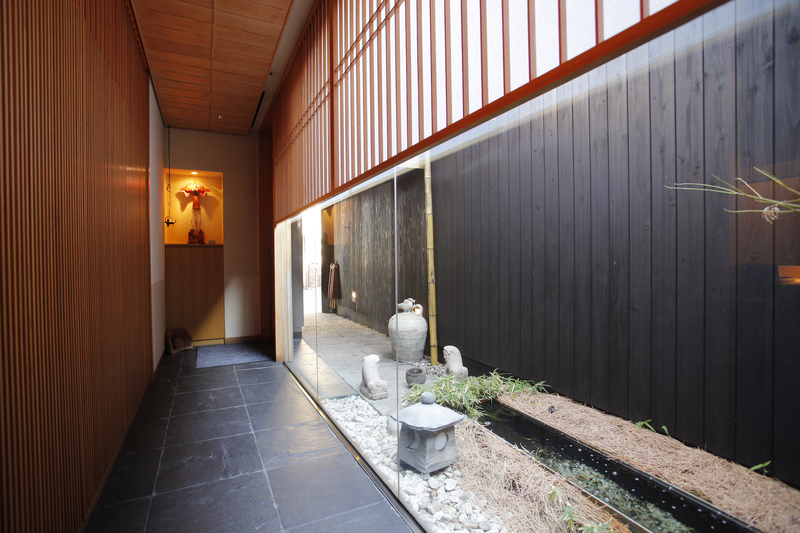 While the work environment functions as a modern organization, Ichiryu Sankodo's shops also emphasize the warmth of human relationships. This is a unique combination seldom seen. 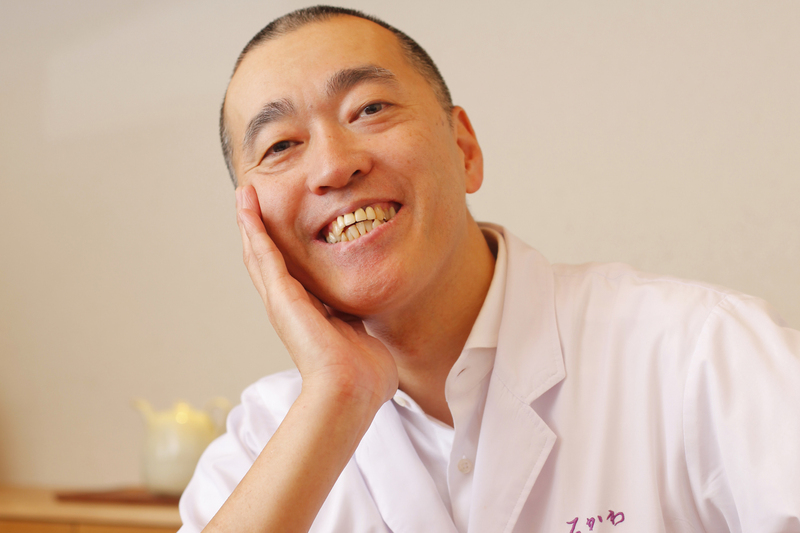 Ishikawa has embodied a philosophy that blends organizational management and compassion, using these to bring joy to the world through food. This is a perfect case study for many budding restaurateurs everywhere.